Sworn to keep the rich tradition alive, social workers in Western Visayas are preparing for the celebration of the 10th Social Work Week on June 13-19, 2014. The theme for this year’s celebration is Advocacy amidst adversity: The Social Work distinction. It will highlight the peculiar role and capability of social workers to make the best or most even out of the worst condition/situation in life. The event will kick off with a motorcade on June 13 simultaneously in respective provinces/cities to culminate with a launching program. The following day, Social Work students from five schools of Social Work in Panay and Negros will hold their respective Social Work Camps to include forum, sharing, literary and musical contests and sports. This will be participated in by Central Philippine University, Capiz State University, Colegio del Sagrado Corazon de Jesus, Iloilo Doctors College, University of Negros Occidental-Recoletos. Other activities include photo exhibit, forum, symposium, and advocacies/promotion of the Social Work profession. It will be recalled that in 2005, Ilonggo social workers met in Central Philippine University to discuss and plan out activities to promote the social work profession. 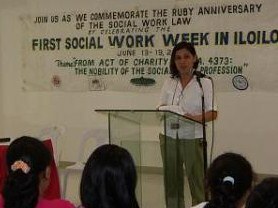 It was part of the preparation for the Ruby Anniversary of the Social Work Law at that year. R.A. 4373 was passed on June 19, 1965 to regulate the practice of social work in the Philippines. However, it was noticed that the significance of the date of the passage of the Social Work Law had not been officially observed unlike other social welfare legislations which were passed even later. The consultation sparked the move to advocate for the declaration of June 13-19 as Social Work Week which eventually gained nationwide support. The week-long celebration is spearhead by Social Workers Organizations Regional Network (SWORN). Launched in 2013, SWORN will serve as coordinating body of all social work organizations affiliated with recognized national bodies, as well as other independent ones.It will also keep the rich heritage and tradition alive. Records show the significant contribution of Ilonggo social workers in the history of the Social Work profession. 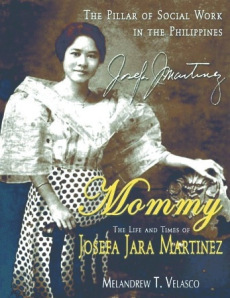 The first and foremost among Filipino social work pioneer is an Ilongga- Josefa Jara Martinez. Martinez was the first executive secretary of the Associated Charities, considered to be the forerunner of social work in the Philippines. She was also the founder and first director of the first school of social work in the Philippines, now known as Philippine School of Social Work which was affiliated with the Philippine Women’s University. In 1978, she was awarded as Social Worker of the Year Award by the Professional Regulations Commissions. It was also learned that the social worker –turned-senator, who authored the Social Work Law, had her roots in Iloilo City. Sen. Maria Kalaw- Katigbak, who held the distinction as the lone woman member of the Philippine Senate (1961 up to 1963), is a daughter of Pura Villanueva Kalaw, a renown Ilongga feminist/suffragist and writer. She organized the first ever feminist group in the Philippines, the Asociacion Feminista Ilonga.